Many film aficionados would argue that Ivory’s Oscar was long overdue. For decades, as half of the famed Merchant Ivory Productions, he co-authored, produced and directed numerous critically lauded films that garnered 31 Academy Award nominations and six statuettes. 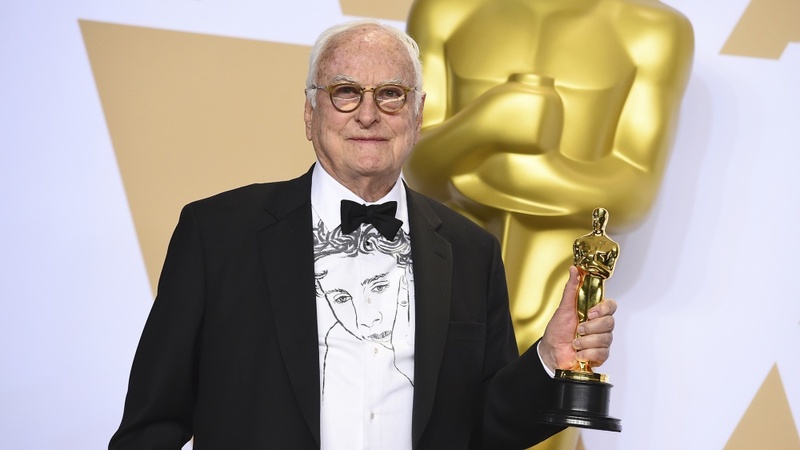 In past years, Ivory had received best director nominations for “A Room with A View,” “Howards End” and “The Remains of the Day,” but last night’s screenplay award was his first Oscar win in an individual category. Ivory is a recipient of the Lawrence Medal, the College of Design’s highest honor for its graduates, and his papers are held by UO Libraries’ Special Collections and University Archives. A regular visitor to Eugene, the Oscar winner last came to campus in February for the 26th Queer Film Festival, where “Call Me by Your Name” was screened for a sold-out audience at Erb Memorial Union. In the question-and-answer session that followed, Ivory explained that he first became involved in the project only intending to serve as an executive producer. But when Italian filmmaker Luca Guadagnino signed on to direct, he suggested that Ivory consider co-directing the movie with him. Despite his reservations, Ivory agreed to the collaborative directing arrangement on one condition: that he be allowed to write his own screenplay. Working from André Aciman’s novel, he spent the better part of a year refining it. Guadagnino was impressed — although he would end up directing the film on his own due to some issues with investors, he still decided to shoot it from Ivory’s script. “When it comes time to write an adapted screenplay, there are advantages to having been a director,” Ivory reflected. “You have the book in hand. There is the dialogue, there is the set-up, there is the emotion for the scene. Basically it’s all there in front of you, but you have to reorganize it somehow. Set in Italy during a single, idyllic summer, “Call Me by Your Name” tells the story of the love affair between 17-year-old Elio, growing up in a cosmopolitan family of academics, and Oliver, the American graduate student who boards with them and assists Elio’s father with his research. The highly internalized, first-person narrative of the novel proved challenging to adapt for onscreen storytelling, Ivory said. The finished film contains elements from the book, plus elements that he added as screenwriter and elements reflecting Guadagnino’s decisions as director. Ivory explained, “An example of a scene with a lot of dialogue that I took pretty directly from the book is the scene between the father and the son near the end. All of that was written out by Aciman. But there weren’t that many scenes with extensive dialogue of that kind. In addition to sharing insights about his screenwriting craft, Ivory also reminisced about growing up in Klamath Falls. Ivory began creating miniature “rooms-in-a-box” when he was 13, and by the time he was in high school he decided that he wanted to be a set designer for the movies. However, he had no clue how to break in. When he asked a family friend for advice, the man suggested that studying interior architecture might be a good starting point. “I knew the University of Oregon had a terrific architecture school, so it was on to Oregon,” he said. Ivory studied architecture and fine arts. Looking back, he said that he enjoyed his time in college, although fellow art students of the era tended to deride his dream of working in the movies. “If I had wanted to be a great painter or sculptor or something like that, perhaps they would have been more approving,” he said. While he was in school, Ivory recalled, he designed stage sets for a French-language play starring another Duck who would go on to an acclaimed career in cinema, James Blue. He also created an architectural diorama that is still retained in the permanent collection of the Design Library. After graduating from the UO, Ivory earned a master’s degree in filmmaking from the University of Southern California. For his thesis project, he wrote, photographed and produced a half-hour documentary, “Venice: Theme and Variations.” It was named by the New York Times as one of the 10 best nontheatrical films of 1957, launching Ivory’s professional career. Other Duck alumni also were well represented among the academy’s honorees. Richard R. Hoover, who earned a degree in fine arts in 1980 and has served on the Dean’s Advancement Council for the College of Design, won an Oscar for best visual effects in recognition of his work on “Blade Runner 2049.” The award was shared with John Nelson, Gerd Nefzer and Paul Lambert. While 1996 UO graduate Bergen Swanson did not receive a statuette of his own, “Three Billboards outside Ebbing, Missouri,” on which he served as an executive producer, collected major awards in the categories of best actress in a leading role and best supporting actor. The Oscars went to Frances McDormand and Sam Rockwell respectively. Jake Swantko, who graduated from the School of Journalism and Communication in 2011, served as director of photography and associate producer on “Icarus,” winner of the Oscar for best documentary feature.